By some accounts, Jake and Jackie Adams of Redondo Beach have been on their honeymoon for over 12 years. 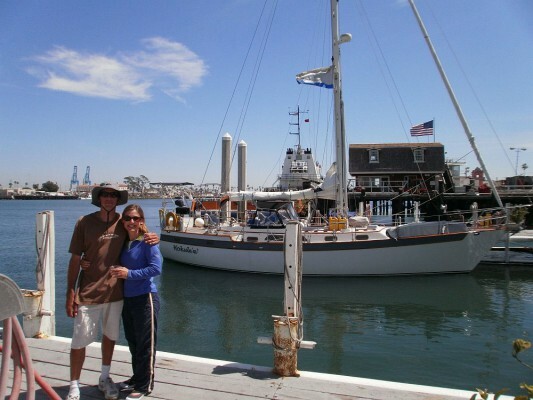 The couple married in 2000 on Catalina Island and sailed away from the wedding – an aloha shirt and barefoot affair – aboard their new seafaring home, a Hunter Passage 42 they named Hokulani. At first they didn’t go far. They docked at the Redondo Beach Marina, where they lived for 11 years. But in the last two years Jake and Jackie have traversed thousands of miles of Pacific Ocean together. Five years ago, they swapped Hokulani for a 45’8” Liberty 458, and in 2011 quit their jobs – Jake was managing the airside development program at LAX and Jackie was an accountant – and sailed into the sunset. Aboard the Liberty, which they named Hokule’a, the Adamses have sailed from Redondo Beach to Mexico, through the Marquesas and Tuamotus, to the Society Islands and the Cook Islands, to Niue and Tonga and New Zealand, to Fiji and Vanuatu and New Caledonia. They made landfall in Australia late last year, but their adventure isn’t over yet. 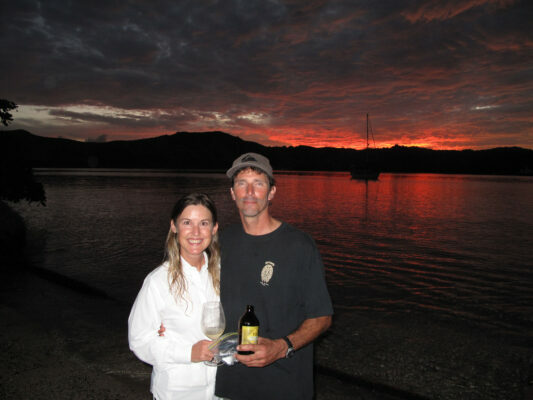 Jackie and Jake Adams pose with Hokule’a moored in the background in Fiji. The Adamses are coming home this month while Hokule’a waits out cyclone season in Sydney, and then they plan to hit Indonesia, Malaysia, Thailand, South Africa, South America, the Caribbean and the East Coast of the U.S. before sailing through the Panama Canal, up the coast of Mexico, and back into King Harbor. The entire journey will take up to seven years. Originally from Virginia, Jake and Jackie met through mutual friends in high school but they didn’t reconnect until they were both at Virginia Tech where, by some stroke of fate, Jake’s roommate was dating Jackie’s. This time it felt right, and Jake and Jackie started seeing each other. Not long after graduating from college, Jake took a job in L.A. and Jackie followed six months later. That was in 1989. Now, 24 years after they ceased being “just friends,” Jake and Jackie are almost never apart. “Literally for the last two years since we left we’ve never been apart from each other more than a couple of hours. I’ll go out diving or something and she’ll be on the boat but other than that we’re always together. The number one comment [Jackie gets] from her friends is, ‘Wow, I could never spend that much time with my spouse.’ And I think that’s sad,” Jake said. Their relationship works, Jackie said, because it started off on the right foot. “I think it works because we were best friends before we started dating and it grew from there. We just have a lot of the same interests but we also have different interests and we’re fine with that,” Jackie said. On the boat they take turns doing 3-hour night watches, and when they’re on land, they hike, walk, and go for runs together. Still, they’re relishing the extended opportunity to get to know each other. “I’m still learning stuff about her – when you’re working you’re gone all day long and you get to spend a couple of hours with [your spouse] before you go to bed, but now we’re spending 24 hours a day, 7 days a week, together and I’m still learning about her,” Jake said. 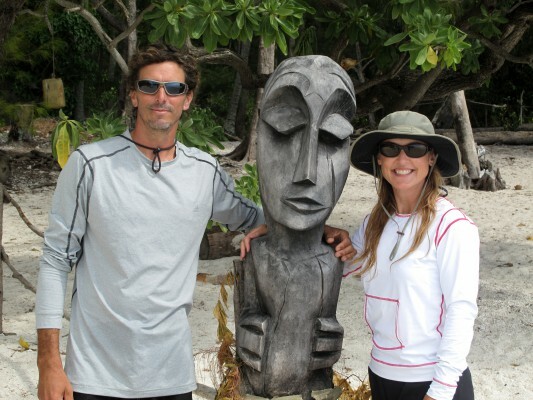 Jake and Jackie Adams pose with a tiki statue in Moorea, French Polynesia. Living in close quarters, they can’t avoid or deny the issues that arise, naturally, in any relationship. “You’ve got to have good communication, otherwise things build up. It’s much too small a space not to talk about things,” Jackie said. But the journey has been, for the most part, seamless, and Jackie and Jake both agree with a resounding yes that it’s brought them closer together. At this point they’re certainly not in a hurry to get back to shore for the long term. This is the second love story in a series running through Valentine’s Day.